The analysis of how institutions are formed, how they operate and change, and how they influence behavior in society has become a major subject of inquiry in politics, sociology, and economics. 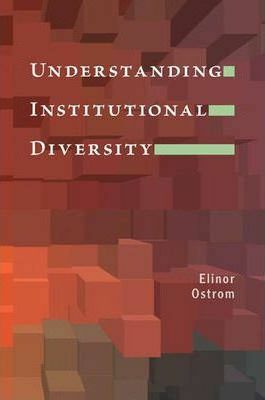 A leader in applying game theory to the understanding of institutional analysis, Elinor Ostrom provides in this book a coherent method for undertaking the analysis of diverse economic, political, and social institutions. Understanding Institutional Diversity explains the Institutional Analysis and Development (IAD) framework, which enables a scholar to choose the most relevant level of interaction for a particular question. This framework examines the arena within which interactions occur, the rules employed by participants to order relationships, the attributes of a biophysical world that structures and is structured by interactions, and the attributes of a community in which a particular arena is placed. The book explains and illustrates how to use the IAD in the context of both field and experimental studies. Concentrating primarily on the rules aspect of the IAD framework, it provides empirical evidence about the diversity of rules, the calculation process used by participants in changing rules, and the design principles that characterize robust, self-organized resource governance institutions. Illustrations note 20 line illus. 15 tables. Elinor Ostrom is the Arthur F. Bentley Professor of Political Science and Co-Director of the Workshop in Political Theory and Policy Analysis, and the Center for the Study of Institutions, Population, and Environmental Change at Indiana University, Bloomington. Her books include "Governing the Commons: Rules, Games, and Common-Pool Resources" (with Roy Gardner and James Walker); "Heterogeneity and Cooperation in Two Domains" (with Robert Keohane); "Trust and Reciprocity: Interdisciplinary Lessons from Experimental Research" (with James Walker); "The Commons in the New Millennium: Challenges and Adaptations" (with Nives Dolsak), and "Foundations of Social Capital" (with T. K. Ahn).